Characterization and identification of gems by the use of color filters has always been an appealing approach because of its affordable simplicity and the ease of examining multiple specimens. Featured here is a combination color filter and dichroscope which allows one to distinguish genuine Tanzanite from all of its imitations, such as blue synthetic Forsterite. Tanzanite-colored synthetic Forsterite shows distinct dichroic colors similar to those of Tanzanite. Nevertheless, these two materials are easily differentiated by viewing through this color filter dichroscope. Synthetic Forsterite exhibits a greenish body color, while Tanzanite shows a pinkish-orange color. Only Tanzanite shows both this pinkish-orange color and the correct dichroic colors. Regardless of appearance through the color filter, all other presently known simulants fail to display the proper dichroic colors when examined with the polarizing filter dichroscope. Place loose stones table down on the white viewing surface that comes with the filter kit. Illuminate with a bright incandescent light, such as a penlight. For very dark stones, use a strong light very close to the stones, and for mounted stones, strongly illuminate from below. Do not use fluorescent light or sunlight - this will introduce a misleading green color. Through the filter, the viewing surface should appear a dim pinkish-gray color. Now hold the color filter as close as possible to the eye when viewing the test stone. Note the apparent color of the stone, consulting the table below. Observe the illuminated stone on the white viewing surface while holding the filter just above the stone - at least 14 inches from the eye. Move the filter from side to side across the black strip dividing the two transparent polarizing filters, as seen in the photo at right. Change the position of the stone and the filter movement several times so as to confirm your observations. Note any color changes observed. You should be concerned with the "body color" of the gem as seen through individual facets - not surface reflections or dispersion flashes. Full instructions are included. This product typically ships within 1 business day. 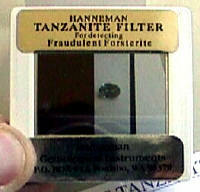 Good product, but I had prefered a full filter instead of half filter and half dicroscope witch is not very usefull. Thanks anyway.